Baby Pictures are being collected of the senior class for the 2019 yearbook. Please use the following link to upload the baby picture of your child. No description is needed. Click here to Check out the latest Art Honors News! Rep from Cozy will visit Par Hills at the end of each sports season for fittings. Don't want to wait? Visit Cozy Formalwear in Morristown for a fitting and immediate order. Bring your Varsity Letter. 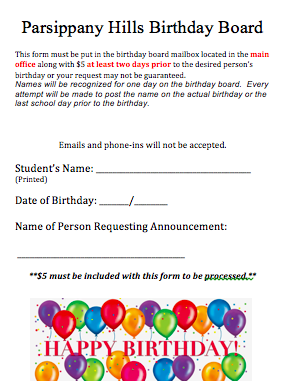 Order form is attached. Questions ask Ms. Bonnet (sbonnet@pthsd.net) or Mrs. O'Boyle. Looking to engrave a brick on the varsity club court? Click here!